The 1940 model year was significant in the history of Indian motorcycles, with the addition of skirted front and rear fenders on all of its models; this is a feature that remains emblematic of the Indian line to the present day. Mechanically, the Chief and Four models also received a new frame with an innovative dual plunger-type rear suspension, as opposed to the unsprung rear wheel and the large, low-pressure tyres relied upon by Harley-Davidson. Based on a remarkably solid large-tube frame, the new models continued to build on the marque’s well-deserved reputation for smoothness and excellent handling. While Indian was ultimately unsuccessful in its bid to become the major supplier of motorcycles to the US Army, Indian did supply many military-specification motorcycles to other Allied armies and domestic police departments during World War II. Following the end of hostilities, the Indian model line consisted solely of the V-twin Chief, in order to meet the pent-up demand for new motorcycles, as well as to conserve funds for the development of a new model line. In 1945, a change of ownership occurred, with a group led by Ralph Rogers purchasing the company from DuPont and, in 1948, the historic Springfield, Massachusetts, factory, affectionately known as the ‘Wigwam’, was closed in favour of a new facility. 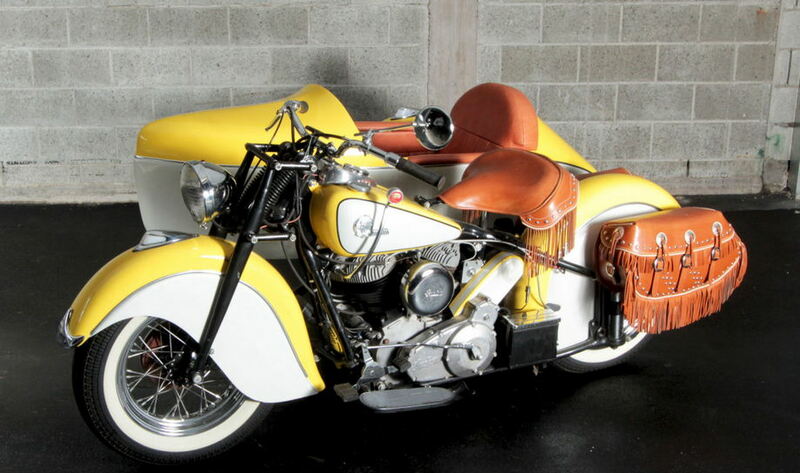 The example offered here is a fully restored Indian Chief with sidecar, and it is finished in yellow paintwork with a black frame and a tan leather fringed seat with matching tan saddlebags. Prior to joining the car museum, the motorcycle was completely restored and, since then, it appears to have travelled for fewer than 20 miles. Complete with polished chrome wire wheels, whitewall tyres and extensive brightwork, this is a visually appealing example that remains in excellent cosmetic condition and is awaiting its next owner.